As a global supply chain logistics provider, Mainfreight offers managed warehousing and international and domestic freight forwarding. With over 240 branches around the world, Mainfreight offers sophisticated logistics solutions in and out of the most dynamic economies in the world. Dr. Richard Quest, Executive Director, Books in Homes USA, joins Mainfreight team members, school district administration, and Mike Moore, former Prime Minister of New Zealand and his wife, Yvonne, at the Alexandria City School District to deliver 35,000 books by truck in 2011. 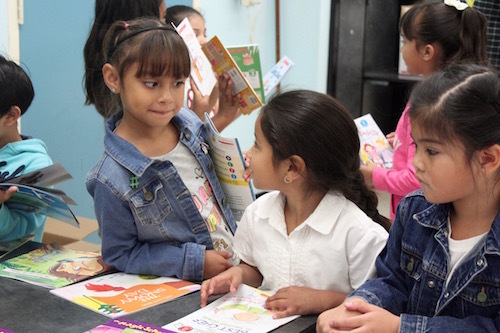 In the spring of 2018, with the help of Mainfreight Americas, Philadelphia-based Books in Homes USA began serving more than 2,000 children in Carson, California and its surrounding communities, just miles from Mainfreight’s National Support Center. 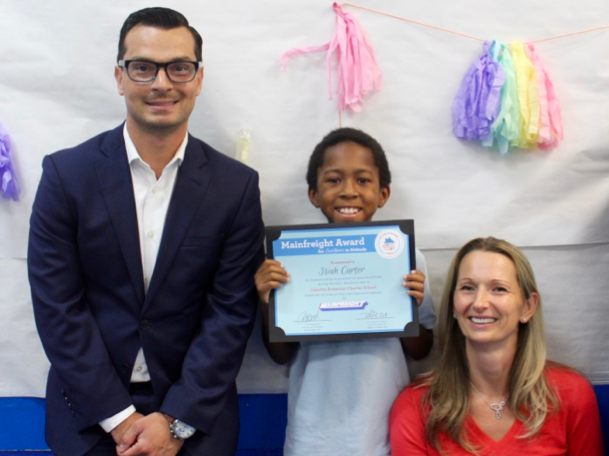 Lorenzo Cometa, Branch Manager, CaroTrans International, and Silvia Mueller-Thompson, Branch Manager, Mainfreight Los Angeles, present third grader Isiah with the Mainfreight Award for Excellence in Attitude at Celerity Achernar Charter School in Compton, CA. The Books in Homes program would not be possible without the support of Mainfreight and other committed partners. Learn more about how your team can support children in your community by contacting Dr. Richard Quest, Executive Director, at rquest@booksinhomesusa.org. Mainfreight is the founding corporate sponsor of the Books in Homes program. Since its inception over 20 years ago in New Zealand, the program known as “Duffy Books in Homes” has grown rapidly and has become a worldwide initiative. 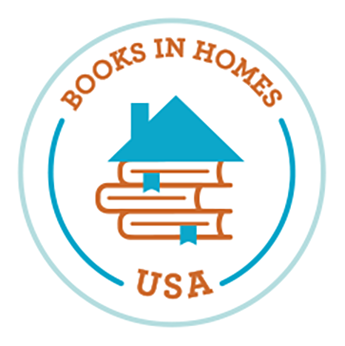 In 2008, with the help of Dr. Richard Quest and Kevin Drinkwater of Mainfreight, the program grew its wingspan to North America where it is known as “Books in Homes USA”. 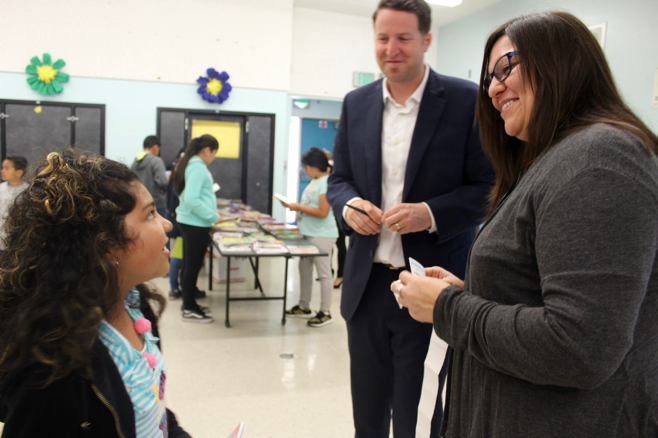 Matt Friedman, Logistics Branch Manager, and Regina Warden, Logistics Coordinator, speak with students at Dominguez Elementary in Carson, CA, just 10 minutes from Mainfreight’s National Support Center. At the end of each academic year, one student from each participating school is selected for the Mainfreight Award for Excellence in Attitude. Setting new targets, consistently challenging ourselves, and approaching each day with a positive attitude are not only criteria for the award but are core values of the Mainfreight culture. Mainfreight believes these traits, along with a strong foundation of literacy, support success – especially for kids in school and later in life. Students at Dominguez Elementary in Carson, CA choose their books during an end-of-year celebration. 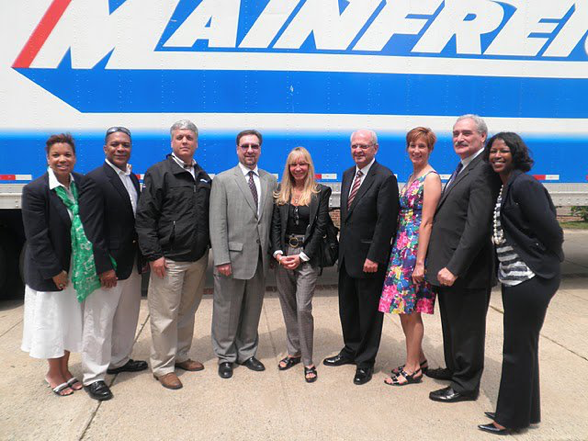 Click here to learn more about Mainfreight.